Jay-Z may be boastful to the point where we begin to doubt if he really is all that big to begin with. When someone spends that much time trying to tell us how good something is, we usually proceed with caution. However, Jigga rose up the ranks, dating all the way back to 1996. Since then, he’s snagged a princess, built up an empire, and molded a musical career that ranks with the best in recent history. This past Saturday, at New Jersey’s own Izod Center, he took his spot as one of the truly gifted performers of our era. Allow me full disclosure. In all honesty, my choice in music does not usually involve much of Jay-Z. With that being said, I came to the show open-minded, and with the knowledge (via word of mouth) that the Brooklyn born rapper could put on one hell of a show. Now? I’m a believer. In fact, for all of you griping about his multiple headline appearances at (just about) every festival this summer, you will soon be eating crow. Jay-Z brings more than just large sets and big words. He illuminates the night. When the lights shut off, a digital clock counted down and once it hit four zeroes, Jay-Z rose from the center of stage and kicked off the night with “Run This Town”. Under backling lights shaped like a futuristic NYC skyline, Jay-Z prowled the stage afront a full-on backing band, which came off more like a traveling orchestra, complete with DJs, mixers, electronic samplers, a horn section, a bassist, a guitarist, and a drum section. Pulsating bass and crisp beats created a rich foundation for Jay-Z to work his hits and rhymes off and the crowd followed suit, moving non-stop as the frontman worked at a furious pace. Jay-Z works a ton of songs into his set without too much time to rest. The songs don’t feel rushed though as Jay-Z relishes each moment in the song, adding some crowd participation and really doing his best to interact with the entire arena at once. The first half of the set mirrored Atlanta’s set as did the crowd’s energy. Everyone seemed to know the lyrics, everyone had their hands up, everyone was throwing diamonds up. Naturally, there were also plenty of Yankee caps around, too. Being in New Jersey and just across the water from New York, Jay-Z had plenty of fun with the crowd and it felt like another home coming. There was plenty of love for Jersey as well as Brooklyn and New York City. Jay-Z played hits like “99 Problems” and “Show Me What You Got” with an urgency that would suit an eager upstart. Even Young Jeezy’s set, which was moreover an intermission set, kept the momentum going. In some respects, the minor hard hitting set felt like a Broadway performance, only hyping up the forthcoming second act. The crowd only grew more tense, as it roared for Young Jeezy and once an image of President Obama hit the screen above, Jeezy broke into “My President” which brought Jay-Z back onstage to finish off what he started. Jigga continued the same set that he played in Atlanta and fed off the fan support. The constant crowd participation and freestyle rap segues allowed him to show off his “old school” skills in between songs. As the set wound to a close, he continued to thank the crowd, threw out towels to wave around, gave a fan his hat, and even started the “Rocawave” (much like the wave except you put diamonds up and go from one side of the arena to the other and back again leading into the middle working its way to the back). As Jay-Z started into his medley of “oldies”, I noticed a particular trend. With the way his set was arranged, one could easily trace his lyrical priorities and concerns over the years and how many of his songs evolved into something more than just hip-hop. Everything from “Dead Presidents” to “Can I Live” shed an interesting light to the man’s impressive and now iconic discography. 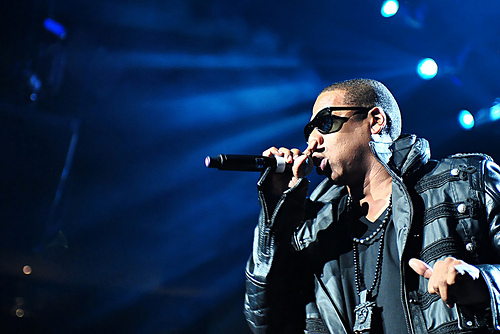 In what only resulted in one hell of a dance riot, Jay-Z concluded the set with some of his biggest hits: “Big Pimpin'”, “Hard Knock Life”, and “Encore”. Despite Jay-Z topping most of his peers, becoming an industry, and selling out arenas, he still feels like he has something to prove. With this kind of ambition and his facetime at festivals worldwide, Jay-Z could soon soar to U2-like heights — if he isn’t there already.